I hope all you guy's that entered got in, if not, hopefully your get a club place. My BIG aim is to smash 2.45 and win a championship start for 2012. To be able to line up behind the elite would be awesome! I feel it may be my last big chance. Following the 100 day plan got me a 4 min improvement on last year and a one min improvement on my old P.B. set back in 2003. I paid the price at The Langdale marathon with a sub par race due to missing out Marius's recover programme, after running London this year. My eagerness to race again meant I ran a 15k trail race, only a week after the April marathon, then got straight back into hard training, result I ran well through May-June, started to go a bit flat in July and really stalled in Aug! End result tired,flat empty legs on race day! This time I've learned my lesson well and have now started the recovery plan. 1) take the recovery weeks of the 100 day plan and follow them strictly the next couple of weeks. 2) take the intro weeks of the 100 day plan and to these thereafter. This will give you about 4-6 weeks of perfect recovery but at the same time smart training. After this i plan to follow the 5K-10K part of the marathon plan working on building speed and getting the sharpness back in my legs. There is a very interesting interview with 9 times Comrades Marathon winner Bruce on Marathon Talk. He talks about the importance of doing your longest runs very slowly and easy and the most important thing is to work on your speed. Marius stresses the importants of what Bruce says and I am now starting to think maybe I pushed it to much on some of my 3 hour hill runs this summer. Wed; 30 mins level one with 5 x 20 sec at 1/2 marathon pace [ Marius says these short bursts help get back the elasticity in the muscles and increase recovery quicker than just steady runs]. Went to see my Chiropractor [ Scott fullwood] today to work on my sciatic problem. Will be adding some new core training exercises to work on strengthening my hips, as my hip tends to drop and allow my foot to rotate inwards as I run. This is very evident on my race photos and may well be the root of my problems. 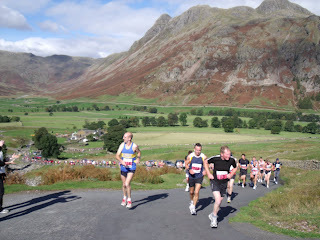 I decided to re-write my race report for the Langdale Mountain Marathon for the club website. I wrote my first report when I was feeling very tired. I hope this gives a better essence of the race. One thing is sure; With time to reflect I feel really proud of taking part and finishing this race. Sometimes its NOT always about the finishing time or placing, it's about finding out about yourself and how you deal with situations! Paul Cain was doing the half and me the full distance after getting a taster with the 1 lap ½ last year. Rob [2nd] in the marathon last year] Sarah and Eddie were our support crew, cheering us on and taking some breathtaking photos. The weather was ideal, sunny with a cooling breeze as we lined up for the start. Both the ½ and marathon start together, so it was hard to know how many were doing the full distance and who would turn off after ‘just’ one lap and finish the 13.1 mile race. I got talking to a guy called Steven Prentice, he use to live in Southport before moving to Glasgow. He said he would run with me as we were looking at about the same pace. Away from the start we headed along the only flat section of road on the course for a mile, soon we turned left and started the fearsome 1 in 3 climb that zigzags its way straight up the mountain. Near the top Rob, Sarah and Eddie cheered us on, not far behind Paul leaning forward with his nose almost grazing the road surface tackled what most have been his toughest challenge of his short running career so far! Rob had told me “never get out of breath on the first lap and you’re be ok”, I tried to follow his instructions and at last made it to the top. The reward was spectacular views of the green valley below and the bare rocks of the mountain ridges that reached high into the cloud and glistened in the bright afternoon sunshine, this was ‘gods country’! Now, a steep suicide descent that pounded the legs followed by short steep hills and more crazy downhills. The legs and body would be tested in every way, even a car would find this a challenge. 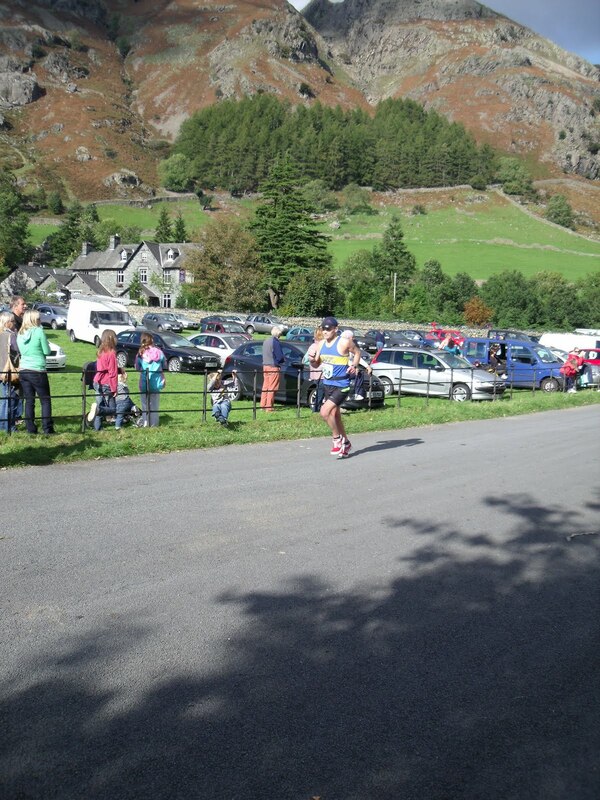 I was now running with Steve and two girl’s running the ½, I was spot on target pace [ I was trying to equal Rob’s time of last year, 3.11] but my legs felt empty and not strong and full of energy as I’d hoped! On to the next climb at 6 miles I took my first gel, over the top and more downhill pounding, at 10 miles we tackle a 1 in 4 monster climb, very steep at first before a series of more gradual rises and hairpin corners. Steve pulls away; I reach the top and then make my way down yet another descent. Now follow a couple of quite undulating Lake district roads [I think they class this as flat in this part of the world!]. I pass quite a few ½ marathon runners who must have set off too fast. Another gel and I reach the end of the first lap in 1.35, just on target but my legs still feel empty like a car about to run out of gas, leaving me with a feeling of impending ‘DOOM’ as I take on the 2nd and final lap. Paul grits his teeth and gives his all over the last miles, finishing in 1.39. A great first performance at the world’s toughest ‘road’ half marathon. I ask him after, “would he ever do the full Marathon”, he just looked back at me with blank staring eyes!!! Steve had stopped for a drink and waited for me to catch up, I said he should have kept going; I’m not on a good day. Once again we reach the first climb again; thankfully there is a good tailwind which pushes me along. 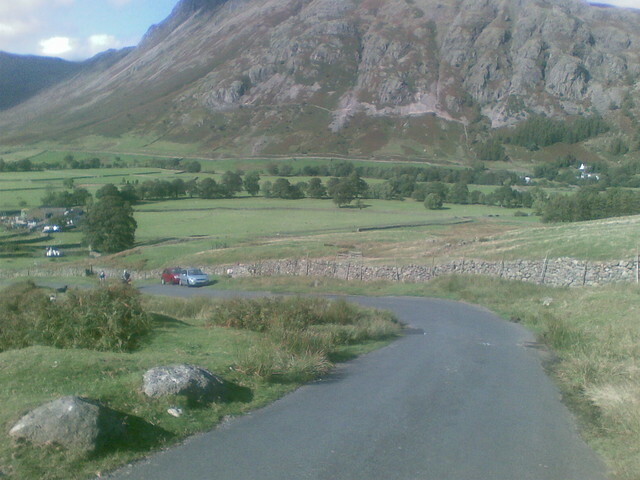 I pass two runners half way up this murderous 1 in 3 climb. I reach the top with great relief, I smile as I take in the surrounding views; AWESOME! Footsteps behind my get louder and a guy from Harrogate catches me up, we run together up to 20 miles. We cross the main road and turn left, the 1 in 4 climb feels much, much worse this time , the last of my energy drains away and I have to walk. Once over the steepest section I force myself into a shuffle and just think to myself ‘keep moving’. I run to the next tree, the next corner, I’m in survival mode now, each second seems like a minute, each mile like two. I bang down more gel blocks and at long bloody last emerge through the trees and the top of the mountain. The legs take a hammering again as gravity pulls my down, a guy comes flying past, all I can do is watch. I’m at the point of not caring about any body else, this is my own private battle just to finish. On to the final two miles of undulating road, someone’s playing a cruel, cruel joke. The road seems to by far more uphill than last time and the road seems to go on for ever, I’m trapped in time, neither moving forwards or backwards, an endless uphill convyor belt of hell! 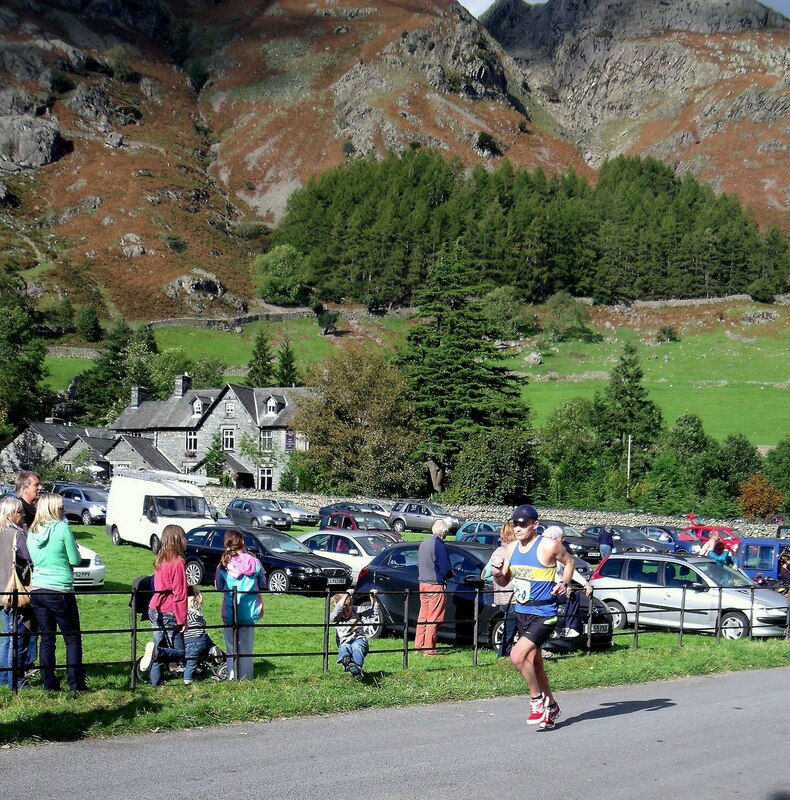 The ½ marathon finishes returning home in there cars beep there horns and shout encouragement as they pass by, I pull myself around cracking a smile as I crest the last hill and flow down a beautiful sweeping descent, I get faster and faster as I pass the car park and the crowd looking on. I savour every last moment, I’m about to finish the ‘world’s toughest road marathon’!!! I cross the line in 13th place in 3.19. THE WORLDS TOUGHEST ROAD MARATHON and MISTAKES I'VE MADE! Writing a report after a good race [I've had plenty of them this year] is easy, but after a race where things don't go to plan can be quite hard. 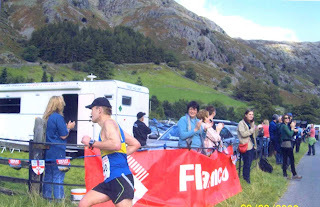 Looking back I can quite clearly see my mistake, after the London Marathon I ignored Marius's recommendations of 3 weeks very easy and raced within a week [my downfall!] and started back on hard training straight away. End result was nine months of hard training and racing, last month I started to notice I was struggling in the last hour of my long runs and I was having to work with increasing effort to hold the correct pace in my fast sessions [I'd gone past my peak and was just plain tired out! 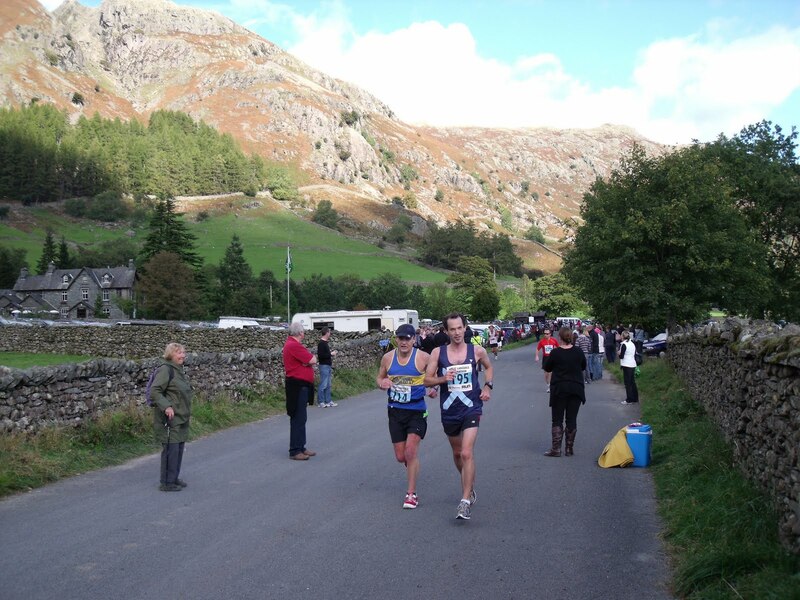 I was still hopeful that after a taper I'd be fresh again and could still pull off a good result at Langdale, sadly this was not to be. The day dawned bright and sunny with a cooling fresh breeze. A big prize list had enticed double the normal numbers this year up from 100 to 200. I'd have to run really well to get inside the top ten this year. The half and full marathon start together so it's hard to know how your doing until the second lap. i set off easy on the first and only flat mile on the course, soon after we turn left and head straight up the 1 in 3 climb that zigzags it's way up the mountain. THE 1 IN 3 CLIMB! Rob who finished 2nd here last year told me to never let myself push to the point of getting out of breath on the first lap, so I ran within myself to the top. 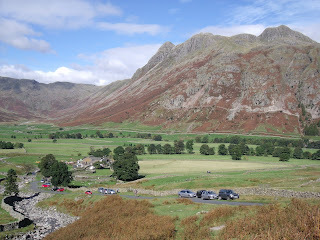 We were rewarded with some stunning views of the beautiful landscape all around. Over the top and down a crazy descent, down into the valley before the second climb. My legs did not feel great, they had an empty kind of feeling to them, not fresh and strong like I was hoping for. I banged down my first gel and started to feel slightly better. I was running with a guy called Steve, he use to live here in Southport but moved to Scotland a few years ago, also there were two girls in our group who were doing the 1/2. 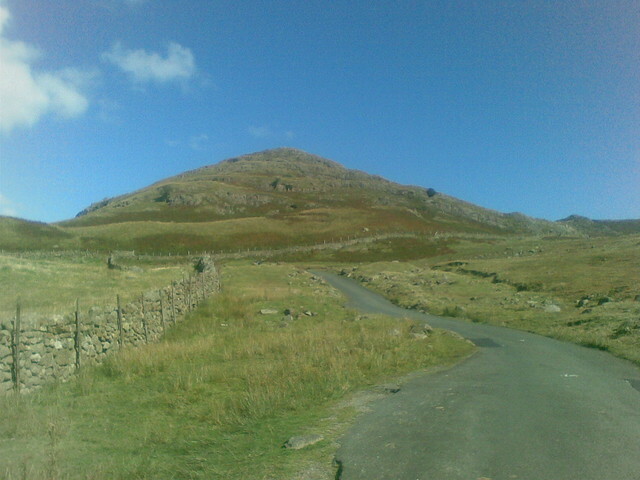 The second climb was not too steep and after cresting the top we sped downhill onto the next challenge a 1 in 4 climb at 10.5 miles, you hit the steep section straight away before the climb gets easier, each corner has you thinking you've reached the top only to have your hopes dashed yet again as the road rises into the distance. Steve pulls away and I find myself on my own, over the top and down a suicide descent. 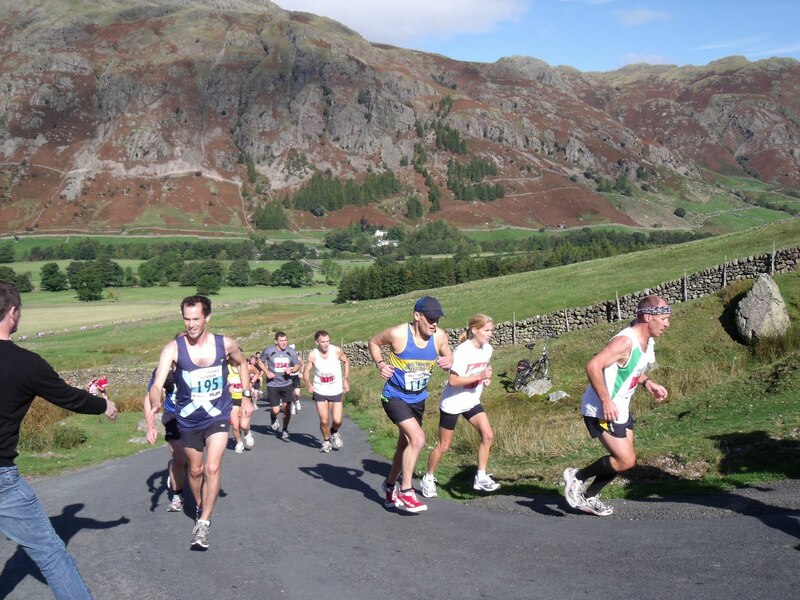 3 miles of Lake District undulating roads follow, I take another gel and once again start to feel stronger as I pass quite a few half marathon runner who set off to fast. 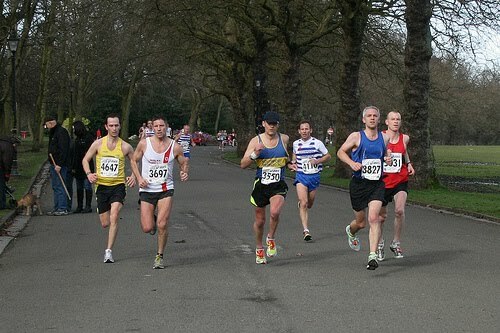 Past the start finish area I'm bang on target with my hoped for pace with 1.35 at half way. But I feel a sense of impending doom as my legs are not responding like they should and still have that empty feeling in them, like a car about to run out of gas! Steve had stopped at the side of the road for a drink and decided to wait for my, I say to him he should have pushed on as I'm not at my best. One mile latter we hit the 1 in 3 for the second time. I pass two guys and with the tail wind behind me the climb does not seem as bad as I'd been anticipating. Reaching the top I felt a big sense of relief as I smiled and looked around at the gorgeous scenery. Steve pushed away on the next downhill and that was the last I saw of him until the finish [ he finished in 3.15 a massive 7 min improvement on last year] I heard someone catching me up , so eased back until he caught me then ran with up to 20 miles. 20 MILES, THE WALL !!! I got back on target pace by the start of the final 1 in 4 climb. My new friend from Harrogate pulled away as i felt the last of my energy drain away like water flowing down a drain. I had to walk the first section then got into a slow run, the hill seemed so much longer and steeper. Another gel block, I just keep moving the best i can. After what seemed like a very long time I reached the top, another crazy downhill, I was shocked to see only 8.5 mph on the Garmin, how could I be so slow! A guy flys past me and now I faced the final 3 miles alone. My contact lens starts floating as my eyes got irritated by the bluster wind, my vision became cloudy as I made my way along the now busy road back to the finish, I keep blinking my eyes and at last I can see well enough to navigate my way into the finish without running into a car! These last 3 miles were endless, someone was playing a cruel, cruel joke with me, why had each undulation suddenly turned into a mini mountain that got steeper and steeper? why was I running more uphill than down? 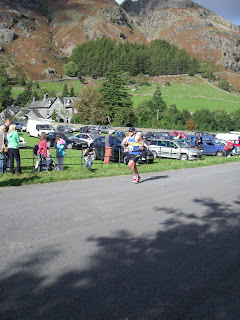 I push all out to a sprint, finishing in 3.19 and 13th place. I finish with mixed emotions, on one hand I knew I could have done much better if I'd been on form, on the other hand I'd just finished the hardest road marathon in Britain. Amazingly 5 runners got under 3 hours, I think only 5 people in the history of the race had managed that before and the guy who won broke the course record with 2 hours 41 min !!! I spent the next hour feeling really bad, sitting down with my head on a table feeling dizzy and sick, I gave it all I could. Eating my breakfast and thinking about todays challenge! I'm looking to it as an exciting adventure, last year my friend Rob finished second in this race, an amazing achievement. I'm setting my Garmin for Rob's finishing time of 3.11, it will give me a rough idea of how to pace myself. 7.20 pace does not sound fast but believe me the route is very demanding with almost 5000 of climbing. I hold Rob's achievement with the uppermost respect and do not take on this challenge lightly! Held over two laps it will be really important to control my effort so I'm strong for the second lap. I've trained for it, with weekend after weekend in the hills, so I feel the course is to my advantage! The hills maybe tough, but everyone else will have to climb them too! Having tried both Pose and ChiRunning my conclusions were that gravity does not pull you forward. Both methods tell you to lean forward from the ankles to use gravity to pull you forward. In fact Danny Dreyer recommends that the faster you want to run, lean more forward. My own conclusion was this just made you land harder on the ground as you fell forward! 1/ letting you lean your body weight into the air resistance or headwind, helping to increase speed. 2/ A slight lean also helps in increasing horizontal force and hence increases speed. BUT leaning forward does not help you use gravity to run faster! NEED A LITTLE INSPIRATION TO LOSE WEIGHT! RYAN HALL TO ATTACK AMERICAN MARATHON RECORD ! Geb back on form with 59.33! Ritzenhein at great north run " I think I wore too minimal a shoe" Ritzenhein explained while he stretched his aching calves! Is his NEW running style working for him ? 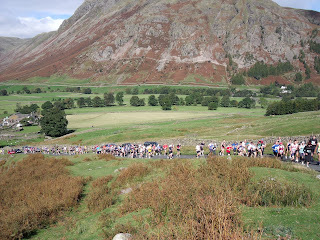 Above photo of the 1 in 3 climb in the Great Langdale Marathon, it has to be climbed at mile 2 and 14 ! Months and months of hard training, Weekend after weekend running in the hills, tempo runs, Progression sessions and sprints. Plus some seriously hard drinking! Here I am, ready for my next challenge, The Hardest Road Marathon in Britain! Just LOOK at that figgin photo!!! I went to my chiopractor Scott Fullwood on Thur, the good news was I was able to walk out of his surgery feeling much improved with most of the sciatic pains gone! Yes I chucked the Zimmer frame away, a miracle to be held!!! Without his treatment over the years I doubt I'd still be running now. I did a session of 20 x 400m. Ever counted more than ten! what do you do once you run out of fingers? I felt a bit sluggish at first but soon got stronger, finishing with a last effort at 5.12 pace. Ran the session on the roads and at times had to fight a strong head wind, but I felt really 'powerful' and at one point past another runner like he was going backwards. Yeah I like that feeling, lets bottle it and sell it on the internet :]. 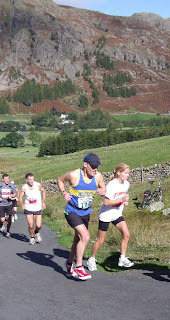 Ran with Paul [who will be running the Langdale 1/2] around Parbold and ashurst with 3 big climbs. Really powered up the Parbold climb hitting 10 MPH near the top! Max speed 14.8 MPH Downhill! Looking back down the Monster 1 in 3 climb! Inside the mind of an elite mountain runner! EARL FEE SUPER LONG STRIDE AT 80 YEARS OLD AND HOW HE STRETCHES! Wow! Just check out this amazing video and see his awesome stride compared to the other guy's restricted pitter patter running styles! Fastest Man STEVE MCLEAN 18.18 Fastest Women Tracey Peters 20.03 New P.B. BACK NEXT YEAR with a possible new couse round the Marine Lake! HOW TO RUN FASTER-MODERN SCIENCE WRONG? Really cool video for you guys!!! 2 Hour Marathon | An American Record?